Official artwork of Chef Kawasaki from Kirby Super Star Ultra. Chef Kawasaki (コックカワサキ, Cook Kawasaki) is an enemy from the Kirby universe. 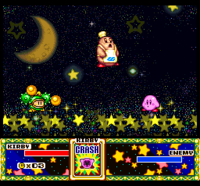 Chef Kawasaki as a mini-boss in Kirby Super Star. Chef Kawasaki debuted in Kirby Super Star as a mid-boss and the source of the Cook ability, and later reprised this role in Kirby Star Allies. Originally, he had two attacks: using his ladle to grab the player character and cook them with a frying pan, or throwing dishes and silverware as projectiles. When copied, the Cook ability allowed Kirby to draw enemies toward him and cook them in a boiling pot, receiving an food item for each defeated enemy. Kawasaki's appearance as an Assist Trophy in Ultimate combines Kawasaki's ladle grab with Cook Kirby's attack. Chef Kawasaki appears as a sticker in Super Smash Bros. Brawl using his artwork from Kirby Super Star. Chef Kawasaki also appears as an Assist Trophy and as a Spirit. Chef Kawasaki attacking Young Link in Super Smash Bros. Ultimate. Chef Kawasaki appears as an Assist Trophy in Super Smash Bros. Ultimate. He uses a ladle to grab opponents from afar, then puts them in a boiling pot, which launches them and creates food; this is similar to Cook Kirby, Kirby's Final Smash in Brawl. He can also throw plates as projectiles, and he leaves behind a random food item before disappearing. Training Mode describes his Assist Trophy: Grabs hold of opponents and mixes them into a pot. Once the broth is ready, he'll make health recovery items! Chef Kawasaki is the only miniboss from a series to be an Assist Trophy. His moveset is inspired by Kirby Super Star and Kirby Star Allies. Chef Kawasaki as an Assist Trophy in Super Smash Bros. Ultimate. Chef Kawasaki using his cooking attack on New Donk City Hall. Chef Kawasaki holding a piece of pie near Duck Hunt on Mushroom Kingdom U. This page was last edited on February 27, 2019, at 13:50.